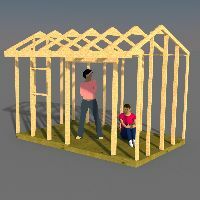 One of the shed foundation options you can use is to build your shed floor on blocks. 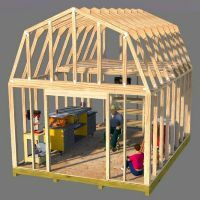 This is one of the easiest options you can use in your shed construction project! 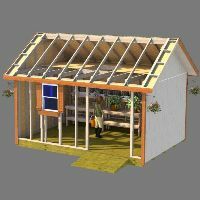 However, if you are required to get a permit for your shed, you may not be able to get by with this option. Most counties across the country require your shed to be anchored in some manner. If you live in an area where you don't ever get high winds or inclement weather, then this option may work for you. One of the strangest sites I have come upon is seeing a shed resting on it's side! I can only imagine that unfortunately it wasn't anchored down and a heavy wind came by and actually rolled the shed over! You don't want this to happen to your shed! Shed doors not working properly. Shed windows not working properly. Cracked siding allowing water into your shed. Warped floor allowing water into your shed. 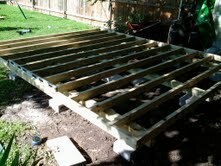 You will save some time and money with this option, but it is not a recommended option for building your shed floor. If this is a shed floor option you want to use, here are some guidelines you can follow. Place your blocks on a 4" bed of gravel. Make sure all of your blocks are level with each other so that your shed floor will totally lever. Support blocks should be in the corners, and every 3' to 4' along all support skids. Floor skids should be centered over your support blocks. 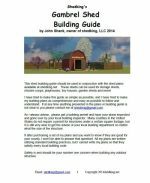 Here are some of the other options you can use for your shed foundation.